NOW, LET ME TELL YOU WHAT I REALLY THINK, By Chris Matthews. Free Press; 220 pages; $25. When David Brinkley started the ABC news show This Week, it, for the most part, followed the well-established format for such shows. Major news guest would answer questions from a panel of journalists for most of the hour. Brinkley set aside a few moments at the end of the show for journalists to bat around a few ideas and for wry commentary by Brinkley. One thing Brinkley made clear. The important guests who came on the show were what the program was all about. Journalists were a distant second in importance. Not anymore. Brinkley retired, and his moderator job was taken over by ABC veterans Sam Donaldson and Cokie Roberts. The panel is completed by the two Georges - Will and Stephanopoulos. There is precious little in common with the Brinkley show. Now the panel is the star. Halfway through the program, the guests are dismissed . . we're running out of time . . . and the second half of the show is given to the blathering of Donaldson, Roberts and the two Georges. They have apparently decided that their words of wisdom are more valuable than anything that might be said by the Speaker of the House. 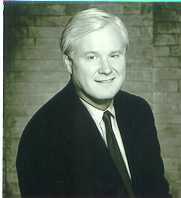 In the loosely defined world of journalism, we now have former Capital cop, Peace Corps volunteer (I've used up my college deferment, and now I might be drafted), presidential speech-writer, top aide to the late Tip O'Neill and syndicated columnist-turned- talk-show host Chris Matthews. Matthews' program Hardball is the video-game version of news shows. Get the guest on for a few minutes, pepper him with questions before he can finish any single answer, curtly dismiss him and then move on to the next guest. He ain't no Tim Russert, who has made Meet the Press the most important, thought-provoking and news-making journalistic program on television. Now, Let Me Tell You What I Really Think is exactly what's wrong. Part thin autobiography, we learn that Matthews grew up in a big Catholic family, went to Catholic school, bickered over politics and did all the other things mentioned above. He even includes an essay he wrote when he was 14. Then he goes on to explain that he tries real hard not to interrupt his guests, but, golly, when they aren't saying what he wants to hear, he just has to cut them off. On George W. Bush: "Here's what I really think: Every time you lower the bar on this fellow, the easier it becomes for him to clear it." And, "Whether success for the country and greatness for the president will follow depends on history not yet written." On Bill Clinton: "The great tragedy of Bill Clinton is that so many of us wanted to trust him." On Africa: "Spend any time in Africa, and you learn it's the altitude that decides the temperature. You want to be as high as possible." On himself: "I think my politics are a result of where I come from." The book takes several hours to read. I'm not sure it took that much time to write.